National Defense Magazine reports that the Commandant, while addressing the National Press Club on August 5, made some remarkably positive statements about his expectations for the coming budget year. There were few details, but the Commandant did refer to the prospects for Coast Guard Icebreakers. We will have to wait to find out what this really means. Will the OPCs be funded; will the program be accelerated? Will we ever see Multi-Year funding of the Webber Class WPCs? Will we see the four aircraft shortfall in the planned fixed wing fleet addressed (and the additional recently identified shortfall in fixed wing flight hours)? Will we see new Inland tenders and new domestic icebreakers? Will we see the obsolete shore facilities upgraded? Certainly we will not see all the problems fixed in 2016. Funding for an icebreaker alone could result in the largest budget ever, but I’ve seen no indication we are far enough along in the procurement process to warrant full funding in FY2016. We have authorization for the Navy to build Icebreakers for the Coast Guard. But that would not increase AC&I budget. The FY2016 AC&I budget request was only $1,017.3M. In 2012 the AC&I budget was $1,463,968,000. I am not sure that FY2012 was the largest ever AC&I budget, but it does mean if the 2016 budget is going to be “the biggest” Congress will need to add at least $446.7M. I suppose several projects could be aggregated to come up to this amount, but there I another possibility. Could this mean the Coast Guard will get a ninth Bertholf class? It makes a certain amount of sense. The FY2016 budget request funds not a single major cutter. The Fleet mix study has documented the need for a ninth Bertholf. We have a hot, increasingly efficient shipbuilding process, and the shipbuilder, HII, is certainly not without influence in Congress. A third NSC in Hawaii could significantly boost our presence in the Western Pacific and would make the long promised Crew Rotation Concept more nearly possible (not to say I think it could work). Just adding a Bertholf class to the FY2016 AC&I request would bump it to close to $1.7B, still short of the $2+B/year the CG needs. Will we see genuine long term movement to adequate funding for the Coast Guard? This entry was posted in Arctic, Budget, icebreaker, OPC, Shipbuilding and tagged Bertholf Class by Chuck Hill. Bookmark the permalink. 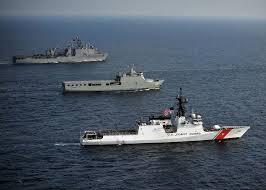 Two reports, each with a different spin, but both report that the Senate Appropriations Homeland Security Subcommittee voted to provide funding for a ninth national security cutter. Still has to get an affirmative vote from both houses and the President’s signature of course. Thanks to Daniel for bringing this to my attention. Probably not, they have only allocated $640M which is about the same price as the previous ship. This Commandant is no better than his 4 predecessors. Simply compare the post 9/11 USCG commission RAND study to where we are now Make sure to pay attention to the 5 and 10 year Deepwater accelerations RAND recommend. Compared to just the base schedule we are 10 years behind. 20 years to what is needed. These Commandants sacrificed the men and women who serve and the country for selfish personal reasons. And they have let industry off the hook where there was a contractual method in place to hold them financially accountable for degraded mission performance.